Pre-menstrual Syndrome – every woman is familiar with it. nervousness & anger, short temper, mood swings, general weakness, etc. appropriate energy flow in a woman's body, strengthening her inner organs. 'jamming' in the blood system, resulting in pain. 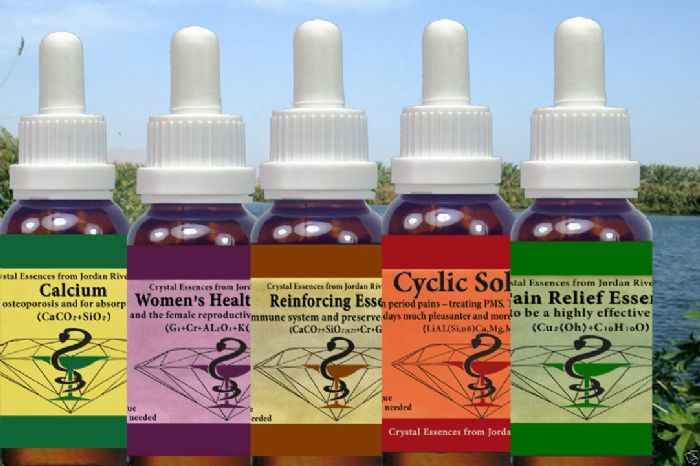 Natural Healing Crystal Essence Health Essence for Women! completely free in your relationship. Natural Healing Crystal Essence for Reinforcing your Immune System! prevent cramps, improve blood circulation and prevent emotional fatigue. You will feel strong and capable. disrupts our life. In most cases, relief is swift. Natural Healing Crystal Essence for Calcium! It is probably best known for helping prevent osteoporosis. the years and our body cannotaccumulate calcium from food as it used to. substitute for medical treatment or medicine. a complement to conventional medicine. The gems contain the same minerals we have in our body. heal the body - spirit - soul.